Need a new desk for your office? Why not use recycled furniture! Faculty first – our mission is to provide for faculty / department reuse. The University of Melbourne Furniture and Equipment Re-use Online Service is now providing faculties, departments and affiliate organisations with a cost effective and immediate solution to their furniture needs. 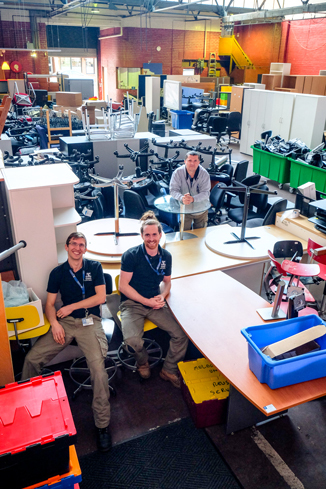 The service offers a range of workstations, storage solutions, and other items for reuse, presenting a sustainable and economic alternative to purchasing new furniture or equipment for your office. The service operates every day the university operates. Appointments can be made to meet the reuse team, and to establish solutions for departments and staff. This service is currently available to University of Melbourne departments, faculties and affiliate organisations at Parkville, Southbank and Burnley campuses. However, if you are from another campus and require items, please contact nick.swan[a]unimelb.edu.au with your request. Furniture and Equipment Reuse Service is a cost neutral service, any costs incurred simply cover the overheads.